The Registrar of Voters certified the 37th Senate District Special Election on Friday night, John Moorlach took the oath of office yesterday afternoon, and he will be on the Senate Floor at his desk for the first time at 2:00 PM today while Don Wagner will be back on the Assembly Floor at 12:00 PM today. 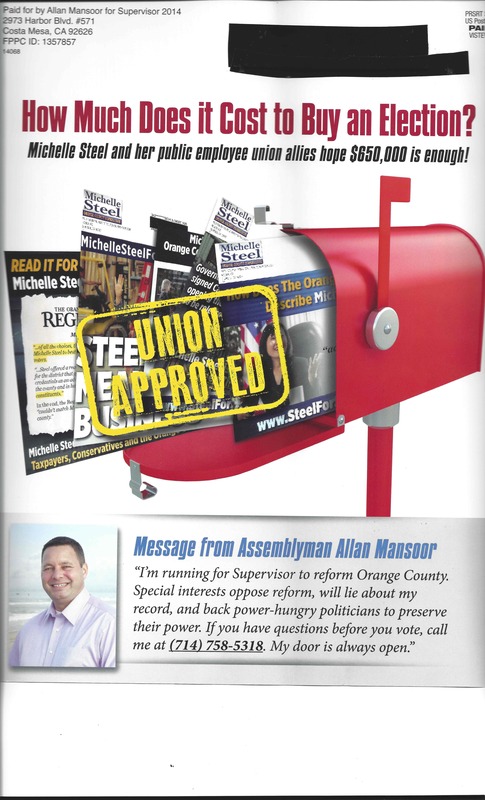 Besides both being conservative Republican legislators from Orange County, there’s something else Moorlach and Wagner have in common: their most recent constituents like them. In the 37th Senate District special election, Moorlach won the 2nd Supervisorial District while Wagner won the 68th Assembly District. Turnout in the 2nd Supervisorial District was 16.8% while turnout in the 68th Assembly District was 15.0%. In the 2nd Supervisorial District (Costa Mesa, Huntington Beach, and Newport Beach), Moorlach beat Wagner by a whopping 20.6%. In the neutral territory outside the 68th and the 2nd (Laguna Beach, Laguna Woods, and the southwestern 2/3 of Irvine), Wagner defeated Moorlach by a large 18.5% margin. (To add insult to injury for Naz Namazi, write-in candidate Louise Stewardson beat her in these areas.) In a testament to how fed up voters were with negative campaigning, it was in these areas where Stewardson and Namazi did the best, getting a combined 8.9% here as opposed to 5.4% in the 2nd and 4.5% in the 68th since there was no “favorite son” candidate in these areas. 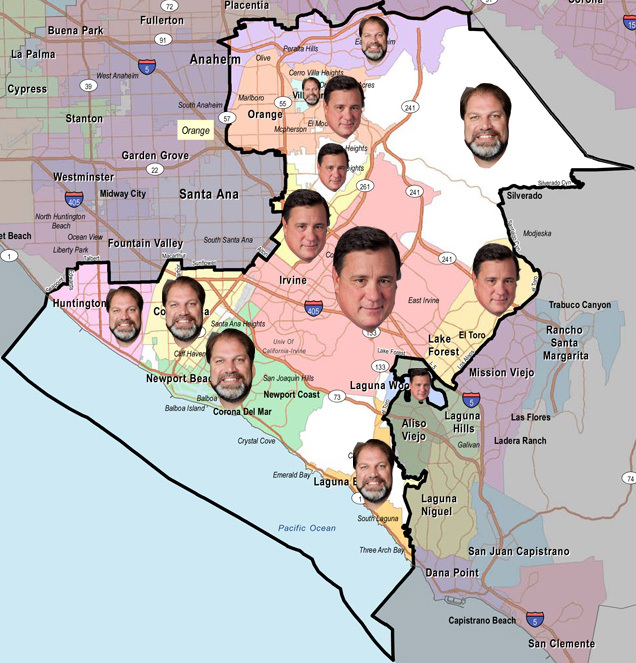 Moorlach’s margin of victory in his hometown of Costa Mesa was a whopping 25.4% (1,712 votes) and in Newport Beach, it was an even larger 27.9% (2,996 votes). Costa Mesa and Newport Beach combined to give Moorlach 4,708 more votes than Wagner. Districtwide, Moorlach defeated Wagner by 4,714 votes. In other words, without Costa Mesa and Newport Beach, Moorlach would have been ahead of Wagner by just 6 votes, and obviously, there would have been a run-off. Moorlach also held on to the other 2nd District city, Huntington Beach, by a margin of 7.3% (599 votes). There were three critical areas where Moorlach broke into Wagner’s home turf: Anaheim Hills, Villa Park, and Silverado. Had Wagner been able to stop the Moorlach incursion into those three areas of the 68th Assembly District, there would have been a run-off. The Anaheim Hills votes are interesting in that Moorlach beat Wagner by 76 votes in Anaheim Hills overall, but Wagner beat Moorlach by 7 votes in the 39th Congressional District. The only portions of the 39th Congressional District that overlap with SD-37 are in Anaheim Hills. 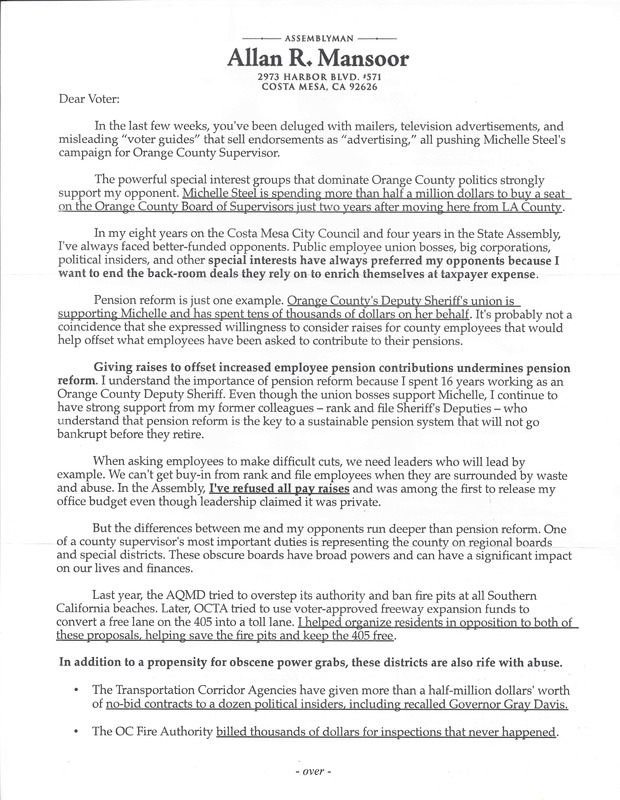 Anaheim Mayor Tom Tait endorsed Moorlach and did a robocall for him. Congressman Ed Royce endorsed Wagner, did a robocall for him, and was listed on Wagner’s mail as an endorser. 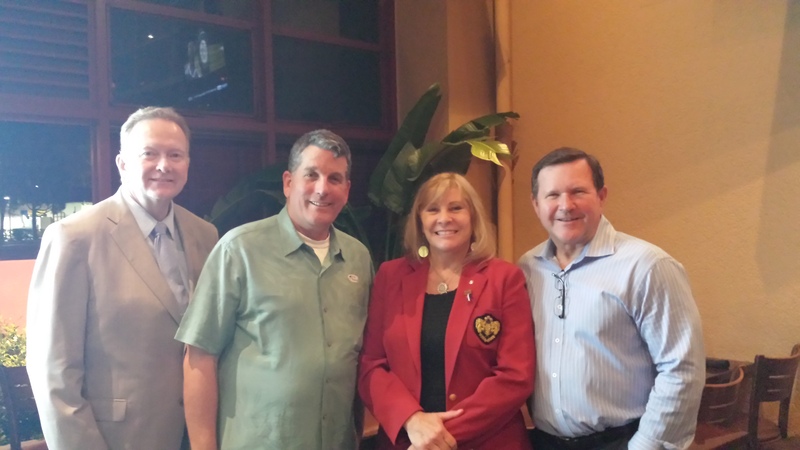 Moorlach was endorsed in Villa Park by Mayor Rick Barnett, Councilman Bill Nelson, Councilman Robert Collacott, and former Councilwoman Deborah Pauly. Wagner was endorsed in Villa Park by Councilman Greg Mills and Councilwoman Diana Fascinelli. Pauly ran Moorlach’s ground operations, which caused Villa Park to buck the trend of the 68th District backing Wagner. I have no explanation for Silverado. In spite of all the union independent expenditures against Moorlach and/or for Wagner, Moorlach actually won the liberal City of Laguna Beach and the flag-banning precincts of UC Irvine. For anybody wondering, Moorlach will be seated in the front row on the Senate Floor and will be seatmates with Cathleen Galgiani (D-Stockton). Moorlach will be one of only two Republicans with a Democrat as a seatmate: the other bipartisan pair of seatmates are Anthony Cannella (R-Ceres) and Jerry Hill (D-San Mateo). Moorlach will be diagonally seated from his old colleague of eight years on the Board of Supervisors, Janet Nguyen (R-Garden Grove), whose seatmate is their eight-year colleague on the Board of Supervisors, Patricia Bates (R-Laguna Niguel). Supervisor John Moorlach made a brief bid for Governor in February 2013 and dropping out four months later (Jerry Brown was re-elected to that seat), announcing a bid for the 45th Congressional District in December 2013 and dropping out three months later (Mimi Walters won that seat), and then flirted with bids for the 74th Assembly District (Matt Harper won that seat) and Auditor-Controller (Eric Woolery won that seat). Both Moorlach and Wagner are conservatives, the former being a bit more iconic because of his prediction of the County of Orange’s bankruptcy back in the 90′s. 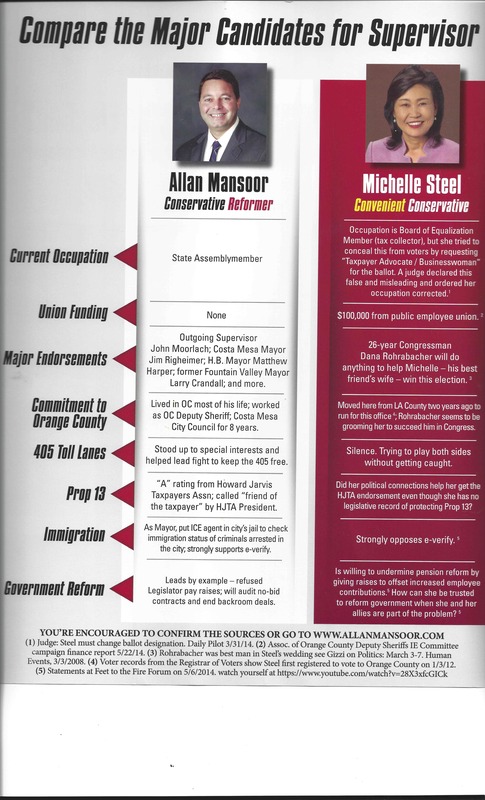 The Morrison household finally received Allan Mansoor’s first campaign mailer this weekend. It was a comparison hit piece that tries to paint Michelle Steel as a Union lackey and career politician. Additionally, our family received a follow-up letter to the one that was previously sent when absentee ballots dropped. The language has changed a bit, so I included it here. With a fair amount of absentees yet to be returned, and Election Day on Tuesday, this piece may just save him from being defeated in the Primary. Only time will tell.